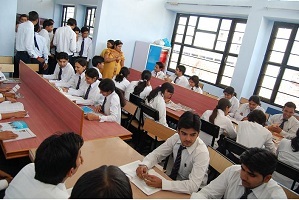 SPSAD exists in a campus of about 40 acres in Rohtak city. The location provides an advantage of being close to Delhi & Rohtak’s Industrial area. Due to vicinity to the NCR and growing real estate and industrial base, the students at SPSAD undertake frequent site visits and are exposed to various upcoming building structure of diverse natures. The building has all amenities required for running various courses and has an excellent spacious infrastructure for about 1500 students. SPSAD hosts excellent computer laboratories with latest core 2 duo computers, supported by powerful servers. The students to computer ratio is 2:1 and all the computers are internet enabled with 2-mbps internet backbone. The entire campus is Wi-Fi enabled and Internet is available to everyone who wishes to use through laptops. Computer facilities at SPSAD are well supported by some of the best software available in the country. SPSAD has entered into an Academic Alliance partnership with “Microsoft”. All Microsoft softwares & support is available to SPSAD students for the Training and Research works. SPSAD lays a lot of emphasis in it, to get a hands-on practice on various softwares and working knowledge of using accounting, office, Architecture packages so that the students find no gap in their learning on joining various Corporate and Architectural firms. Institute’s website has been dynamically designed. Space on website has been allocated to various students clubs and committees. All official policies, internal or external communication are hosted on the website of the institute on real time basis. The Library information and learning resources play a crucial role in supporting teaching and learning activities. The Knowledge Resource Centre reflects the teaching and learning commitments of the institute. It has already built up a very good collection of books and periodicals. The effort is to collect all the reference materials in digital format. The important and current journals are also available in print format. The Resource Centre staff is always available to provide information and advice. Individual and group study spaces, allow different methods of studying in pleasant and comfortable surroundings, seven day a week access provides students with the opportunity to make the most of the resources. Free access to Internet and hi-speed digital connectivity provides an extended access to vast intellectual resources. The institute provides books for all subjects on returnable basis in each semester for a fixed fee that ensures standardization and availability of quality study material. A detailed teaching program outlining the course intent, contents, conductance, assignments and reading materials is regularly updated and provided to students in both hard and soft form. The cost of all this is borne by the institution. AUDIO VISUAL LEARNING AIDS A beginning has been made in the acquisitions and stocking of the video films on latest technical trends. SPSAD provides counseling and career decision support, emphasizing career development as a life process. The institute organizes special workshop to prepare students for the selection process.